Impact Wrestling airs a show tonight main event’ed by a “Fight in the Woods” match between Sami Callihan and Eddie Edwards. The tag team championships will also be on the line and Josh Matthews will sit down with 3x and current Impact World Champion, Austin Aries. Edwards has spiraled in recent weeks, arguably becoming just as sadistic as Callihan. Several people in Edwards’ life, including his wife and Tommy Dreamer, have attempted to calm him down but Edwards won’t move forward until his business with Callihan is finished. 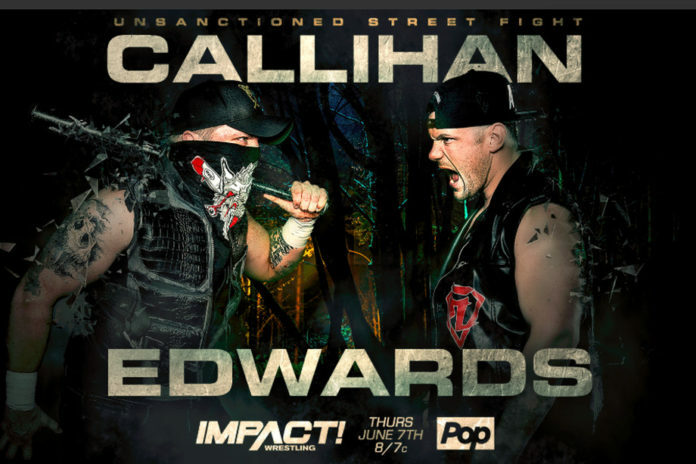 Callihan and Edwards will face each other in an unsanctioned “Fight in the Woods” tonight. Luchadors from Lucha Underground will get a chance to win tag title gold on Impact tonight. It will be the last episode of Impact before the next season of Lucha Underground begins airing next Wednesday. Z&E won the titles from Steiner and Eli Drake recently but there is no rest for the champs, they will be in tough to keep the titles around their waists throughout television leading up to Slammiversary. Will the Mystery Attacker Come Forward? Last week, X-Division veteran Sonjay Dutt was attacked in the backstage area. Joseph Park and Jimmy Jacobs have also been attacked in the back. Sonjay has said he has no memory of what happened let alone of who it was who attacked him. Will the Mystery Attacker come forward tonight? Or will someone else be attacked in the back? Impact Wrestling has promised a segment tonight will be devoted to the new Knockouts Champion, Su Yung. The deranged undead bride has been the talk of the promotion as of late. Last week, Yung defeated Allie in a Last Rites (coffin) match to win the Knockouts title. She’s now locked both Rosemary and Allie in coffins, so a new challenger will have to be determined for the undead bride before Slammiversary (her opponent was actually announced earlier this week but it will play out on television). It appears Madison Rayne’s in-ring career will be continuing in Impact. She recently pulled off a victory over the highly-touted Tessa Blanchard last week. Blanchard had controlled much of the match, however, before Rayne scored a victory on a roll-up. Tonight we will find out more about the 5x Knockouts Champion’s plans for the future. LAX returns to action tonight but will still be without their leader, Konnan. In his place, however, will be Eddie Kingston (now known as King). After regaining his Impact World Championship in controversial fashion last week, Austin Aries will be on vacation this week. He sat down with Josh Matthews for an interview regardless, however. That interview will air tonight. At the press conference in Toronto this week, Aries announced he was merging the Impact Grand Championship and World Championship. This will probably be mentioned tonight as well.